"You're the best mommy in the whole wide world." "These hair clips are wonderful!" "Daddy will be so impressed when he sees these!" My favorite of the three barrettes we ordered is the Daisy Burst (in fact I'm thinking of ordering a larger size clip of this one just for me!). Delaney prefers the Ladybug Love, which is dainty and adorable all at once. Although these prices are more than I'd typically spend on hair accessories for my three-year-old's daily wear, all three barrettes were beautifully produced with amazing artistic details such as the hand-crafted clay daisies and the perfect, little ladybugs. As noted on the Maiden America web site, "The Clay Daisies we use are one of the most difficult items to work with and each one is hand selected, prepared and applied with attention to detail." It shows. 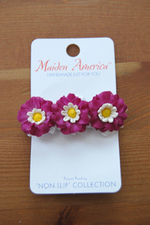 For me, the miniature clay daisies and the non-slip feature make these barrettes well worth their price. When your daughter shows up at preschool or playdates donning one of these beautiful, unique clips she'll be the envy of every girl (and every girl's mom!). Maiden America was started by Tristan Benz, a mother of three girls, who hopes to promote "age-appropriate products as the 'norm' for young girls in America." She also provides flexible jobs for the moms who can work from home to create the barrettes. Yet another reason I don't mind spending a few extra bucks beyond what I'd normally spend for hair clips. I'm not only getting a high-quality, handcrafted product but I'm also helping to support work-from-home moms. That's something I can always get behind. Something else I can get behind? Freebies. And Maiden America included two in our order. A pretty, green "Little Miss Catalina" barrette and a ribbon on which to clip barrettes when they're not being worn. Just another reason they'll get my repeat business. My daughter loved the Daisy burst. She's been asking me to buy that.